A breadth first search is a search that traverses level by level. For example, in a tree, the search will transverse everything from the first layer, to the second layer, the third layer and all the way down to the last layer. BFS is implemented with a queue. Push the root into the queue. Pop the first element from the queue and push its non-visited neighbours. Repeat 2 until the queue is empty. Given a grid of squares with walls at certain locations and two locations A and B, find the minimum distance (going up/left/right/down) between the locations or impossible otherwise. For example if A is at (1,1) and B is at (3,1) but there is a wall at (2,1) then the minimum distance would be 4 (down, left, left, up). Example: A→B, B→D,B→C, C->G will output A | B | C D | G.
Given a tree of letters, and two letters X and Y determine if X is an ancestor of Y or if Y is a ancestor of X or neither. X is an ancestor of Y if X's subtrees contain Y. 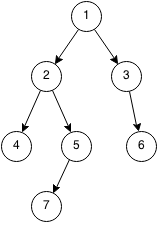 Given a binary tree and a node in the binary tree, find the next node in BFS order of the tree.